Tori Schickel celebrates her rebounding record with head coach Kurt Godlevske before the team’s game against Xavier on Feb. 8. Schickel tallied her 1,051st rebound on Feb. 3 at Seton Hall. Jimmy Lafakis/Collegian file photo. 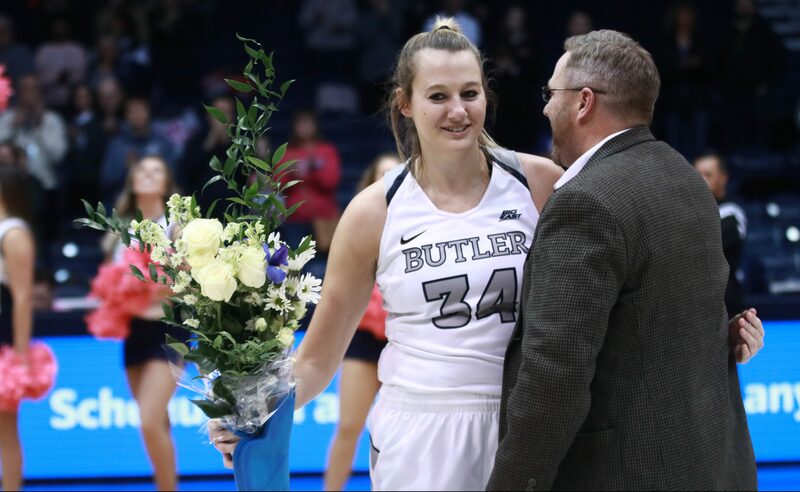 When Butler women’s basketball center Tori Schickel grabbed the rebound — the men’s and women’s Butler all-time record 1,051st rebound — she did not even know. Did not know to care. She simply thought she played bad defense and swallowed one lucky rebound. What was supposed to be a moment of joy and pride, then, was clouded by frustration. More frustration rained down when she peered up at the replay and saw it for a second time. Record? What record? The feeling of frustration in that moment defines Tori Schickel. Defines her as a person and her legacy as a Butler basketball player. The first thing you need to know is this: Schickel is a perfectionist and a strict believer in superstitions. Before warm-ups — home or away — she goes through the same routine. She trots to the same bathroom stall, where she collects her thoughts and calms her nerves. After, she performs a three-pronged drill on one side of the court: three drop-steps, three hook shots and three fakes to the middle where she goes baseline. After tiring herself, she shoots her free throws. Wash, rinse, repeat. At first, Schickel’s pregame routine caught teammates off-guard. It was weird. Odd. Different. All of the above. Now, the team is 18-5, and her superstitions have their backing. But before, the program was a fraction of itself. The Bulldogs were 10-21 by the end of Schickel’s freshman year. So it made sense. Schickel’s teammates had the idea that these superstitions zapped a bad voodoo on the team, and if Schickel stopped doing them, success would follow. Not so fast. To Schickel, her routine is the calm before the storm, an umbrella to the sleet of fast pace, fast thoughts and fast action. Schickel has been repeating her routine since her freshman year, before she cemented her place in Butler history. Back then, no one could predict the player she would evolve into today, not even her own coach. Head coach Kurt Godlevske and Schickel held up a sparkling white basketball — inked with the signatures of her teammates — hand-in-hand at Hinkle Fieldhouse before a conference game against Providence on Jan. 18. The coach and player were frozen in the same moment, smiling wide, standing upright, but their minds were drifting to different places, different times. For Schickel, the 1,000th rebound signaled the beginning of the end. Graduating in May alongside Schickel will be three teammates: Taylor Buford, Michelle Weaver and Jennings. While Schickel harped on the end of her career, Godlevske — whose eyes sparkled like a giddy kid on Christmas morning — reminisced about the beginning. His mind flashed back to Schickel’s freshman year — before the 1,000 rebounds, before the 1,061 rebounds to date, before everything — he just saw Schickel as just another player. She came to Butler from Mater Dei High School in Evansville, Indiana, as a three-star prospect, according to ESPN, and won two Indiana state championships. She posted 10 or more rebounds per game in her final three seasons, totaling a school record 1,156 rebounds by the end of her decorated career. Schickel remembers her freshman year through a different lens. LeBron James? No way. Her mind takes her to the summer trip to Australia heading into her freshman year, when she was intimidated by more skillful, more athletic players. They dominated. She didn’t. Simple as that. Godlevske thought Schickel’s 1,000th rebound would come on Jan. 11, in the team’s game against Xavier. That goes to show Godlevske’s level of expectation for Schickel as every game passes. It is impossible to miss her consistency. She has grabbed at least 10 rebounds in 10 games, as many times as she has grabbed between five to nine rebounds. Only three times has Schickel snagged fewer than five rebounds. Aside from being a dependable player, Schickel is a reliable leader. She leads by example. Every word is filtered, and once emptied from her mouth, they’re molded to crater an impact. Her whispers hold the same importance as others’ yells. After the 20-point loss to Indiana on Dec. 5, Butler players hung their heads and lowered their chins. They were struck by the feeling of their electric season beginning to fizzle out, in the same way it did last season after they started 11-5 and ended 15-17. It was Schickel’s time. Time for her to lead. Time to talk. Finally. It is the inherent ability — the skill, the leadership and the overall consistency — that renders Schickel practically impossible to replace. After every game, the team’s Twitter account tweeted an update: Schickel’s total rebounds and place on the all-time rebounding list. Beside the number was a photo of Schickel, who smiled from ear-to-ear, seemingly ecstatic to break the record. The picture was a façade. In reality, Schickel didn’t keep track of the record, only on wins and losses. Record? What record? While Schickel was reluctant to figuratively pat herself on the back, her teammates relished the hype. After every game, Schickel would watch teammates Weaver, Jennings and junior Kristen Spolyar whip out their phones and refresh Twitter to see if #ToriTracker was posted. And if it wasn’t, they got upset. To them, the hashtag symbolized the physical element of Schickel’s hard work and consistency poured into an accessible social media post. Rebounding is a skill made up of mostly effort and technique. To rebound is to put your body on the line for your team. It’s a less-appreciated reward than shooting, passing, and any skill in basketball. Butler already has Spolyar, a microwave scorer who produces 12.3 points in 29.3 minutes. Butler already has Jennings, a pick-and-roll maestro with scoring and passing chops. Schickel simply needs to rebound their missed shots. Schickel scores too — she’s the second-leading scorer on the team, averaging 12.6 points a game. Score, pass, lead. You name it, Tori Schickel can do it. Just don’t ask her to halt her superstitions.